Love your recommendations here, Amanda! I have been wanting to read One Thousand Gifts, so will order it with my Christmas money. Hope you'll give my novels a look at www.gladetrilogy.wix.com/theglade. Perfect for you and your sons! Love your book list! I really need to start keeping track of everything I read so that I can make a list like this at the end of the year. Usually, I'm saying things like, "Yeah, that one book was really good--if I could only remember the author/title" ;). The Nesting Place and The Giver were two of my top five. Reading Grace for the Good Girl now. I loved the Hunger Games, too, despite their intensity. Thanks for your list! WOW!! Thank you so much, Amanda, for listing Operation Zulu!! Made. My. Day!! You're welcome, Ronie! I really loved Zulu. Looking forward to reading more of your books! Awesome list! 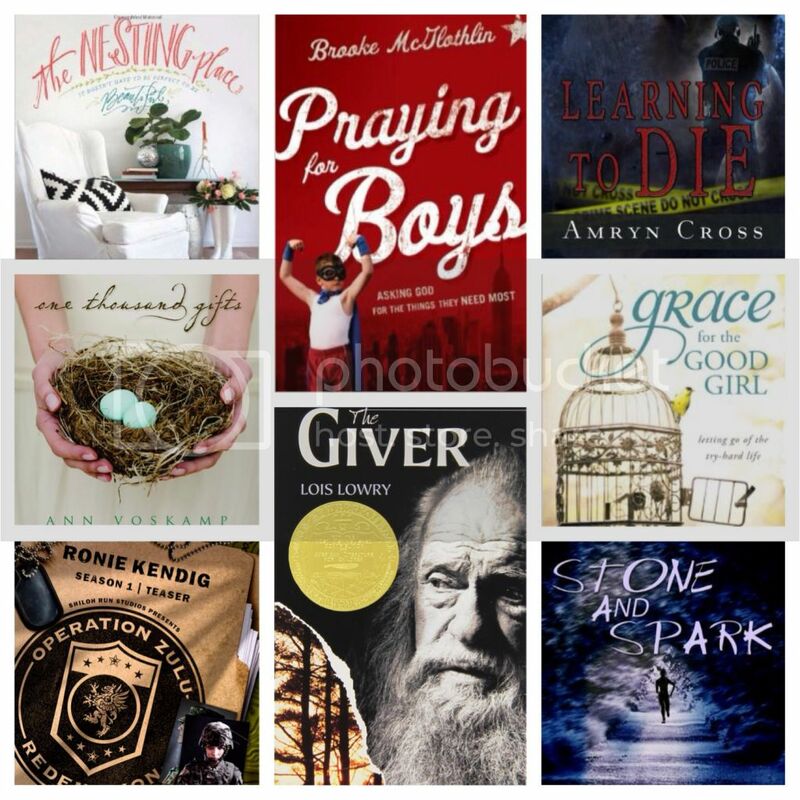 The Nesting Place made my list too and I loved Praying for Boys; I need to revisit it soon! I loved the Hunger Games as well and The Giver is one of my favorites. I have both Grace for the Good Girl and One Thousand Gifts on my bookshelf, might have to make them a priority this year. Love both The Giver and 1000 Gifts. Definitely read the other three books in The Giver quartet. I have The Nesting Place on my Kindle waiting to be read. I loved seeing your book list! It looks like we enjoyed some of the same books this year. I love Ronie Kenig's book so will be looking at the serial novel. I will also be checking out the Stone and the Spark. Thanks for sharing.